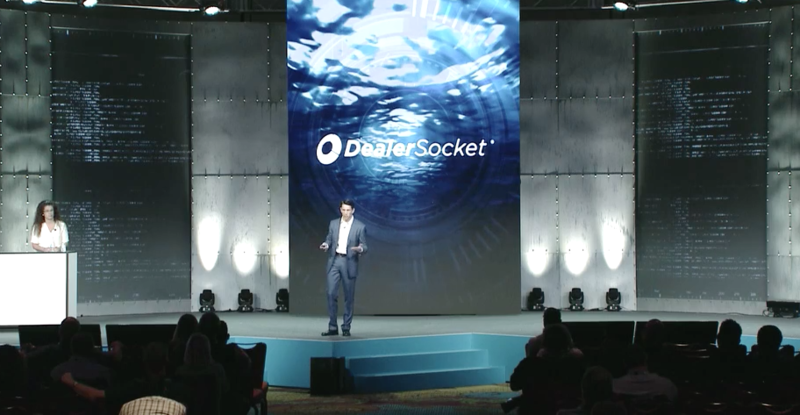 The 7th Annual DealerSocket User Summit demonstrated MIG’s excellent performance of event production services, from concept to execution and creativity to technology. The Annual DealerSocket User Summit (DSUS) is hosted by leading automotive dealership CRM, DealerSocket. Multi Image Group (MIG) was presented the opportunity to produce the annual game-changing corporate event that provides top dealerships with the industry and compliance training they expect, presented in true DealerSocket red-carpet fashion. DealerSocket allows for top dealerships to manage opportunities and create processes in a simple platform. For three years running, MIG is DealerSocket’s choice live event production partner for the auto industry event of the year. The spectacular live event welcomed dealers from franchise and independent spaces. Attendees could choose independent tracks from over 70 unique options in current, pressing compliance issues. MIG and DealerSocket’s event marketing team closely collaborated during the pre/post live event production process, advancing progress with innovative staging, fresh productions & cutting-edge technical event solutions. The 7th annual summit was the largest, best and most successful DSUS to date. Boasting around 1,100 top dealers in attendance from both franchise and independent spaces. For the first time, guests selected their own unique and specialized independent professional development tracks from more than 70 different class options. By supplying an Engaging Digital Environment for guests, the 7th annual DSUS general session event space was both highly engaging and entertaining for summit attendees. Guests were all provided top-notch cuisine, refreshments and entertainment. Headliners Folk rocker Nathaniel Rateliff/The Night Sweats, fresh off Austin City Limits, keynotes given by baseball legend, David Justice, Olympic volleyball player, Casey Patterson and futurist, Brian Solis. Collaboration with MIG allows the 32 person DealerSocket event marketing team to effortlessly plan and seamlessly produce events. The 2017 annual DSUS exhibited a flawless execution and supplied attendees with world-class, unforgettable experiences.